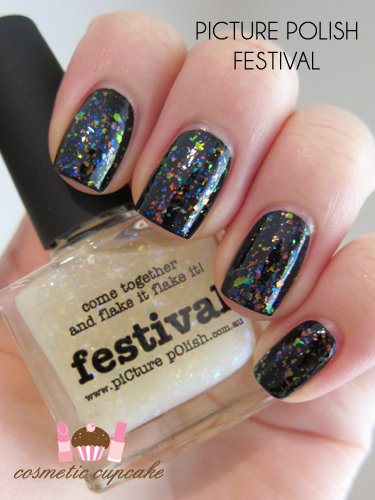 Festival consists of varying sizes of blue, green, red and orange flakies in a clear base. Here I've layered 3 coats over a black creme (no topcoat) and OMG doesn't it just look fantastic?!!! I absolutely adore the different coloured flakies and the almost duochrome effect it has in different lighting. It makes a nice change from the single coloured flakies. I love them too but a change is always nice! 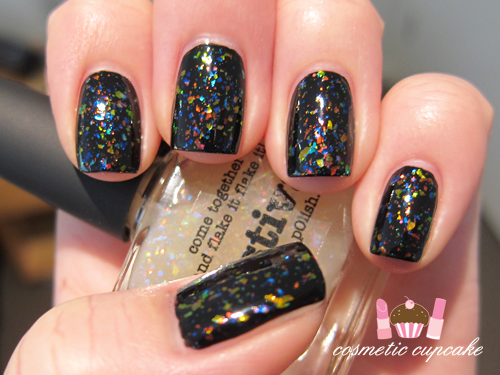 The flakies apply kind of sparsely so you'll need a few coats for full flakie effect. Because you need a few coats it does take a while to dry but it's so worth it in my opinion. The formula is on the thicker side but very easy to apply and the brush was a pleasure to use too. Overall: You NEED Festival in your life. Get thee onto their website and purchase yourself a bottle. Or 2. Or 3. Details: piCture pOlish flakie covers can be purchased online from piCturepOlish.com.au for $11.90. They send internationally too!! For a full list of international stockists you can check it out here. 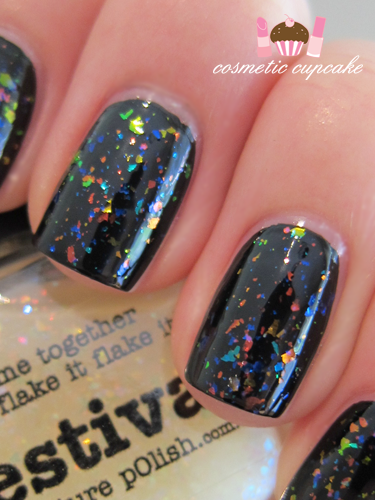 Are you a fan of flakie polishes? Thanks for looking as always! looks gorgeous like a beautiful rainbow! Flakies are my fav too! LOVE the look of these flakies!! WANT SO BAD!! @Dustyn: LOL thanks so much hun!! I used 2 coats of BYS Black Satin for this. It's a pretty decent black but my bottle is getting a little thick. It's opaque in medium coats and dries quite quickly. I'm on the hunt for the perfect black creme myself actually! I don't think I own a flakie in my entire collection....must try one out now. Festival looks fun! Oh gosh... more polishes to buy! hahaha! This looks amazing! I have to get one of these polishes. Haha lol! I actually totally did not know you had done a post on flakies!! Just asked ya outta the blue! LOL! Oh my they are sooo GORGUZ! Need ASAP!